The Attorney-General has issued the following press statement which in a nutshell says that a special task force comprising the Police, Anti-Corruption Commission and the Central Bank has started investigation into the allegations made by WSJ and that raids on the companies mentioned in the article had been carried out and relevant documents seized. Updated: The Deputy Prime Minister has issued a statement expressing his utmost concern over the allegations made by WSJ, which he described as severe. 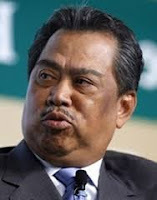 While he welcomed Najib's earlier statement denying the allegations, Muhyiddin Yassin said the MACC, the Police and relevant authorities must begin their investigations in earnest. He also said Najib should sue to clear his name. Abang Din ended his statement asking all Malaysians to pray for the truth to prevail. Amiin. Read Muhyiddin's FULL STATEMENT h e r e.
THE Malaysian Insider is clearly advocating that Najib Razak does not sue Wall Street Journal for defamation. And there I was thinking that the majority of right thinking Malaysians, including most of my commenters/Readers, wanted the PM to fend off the increasingly blatant attacks and take out lawsuits to defend his reputation and that of this country's highest office. I attach herewith the TMI piece. All the lawyers TMI spoke seem to agree that Najib Razak should instead give his side of the story so as to clarify WSJ's account. In short: Engage. And if he has a case, he can then seek an apology from WSJ. My view is that the WSJ did not leave Najib much of a choice but to seek legal redress. The allegations against Najib in the article Investigators believe money flowed into Malaysian leader's accounts are done blatantly and are likely to make readers think that the PM is not just corrupt but very corrupt. And is there no lawyer out there who thinks the PM would be doing the right thing by suing WSJ? Datuk Seri Najib Razak should proceed with caution following the decision to sue the Wall Street Journal (WSJ) for publishing a defamatory article claiming that billions were channelled into the prime minister’s personal accounts, civil lawyers said. Thye said it would not be wise of the PM's ministers and his public relations consultants to demonise any media organisation to win in the "court of public opinion".They said Najib must first attempt to get his side of the issue published in the reputable newspaper or demand a retraction and public apology if the report was untrue, before seeking legal redress. Lawyer Ang Hean Leng said Malaysian leaders like Tengku Razaleigh Hamzah had won suits against foreign publications for injuring his reputation in the Bumiputera Malaysia Finance Limited (BMF) scandal. "Najib, too, could file a suit in Kuala Lumpur or the United States," he said. However, should the prime minister file a suit outside Malaysia, he must submit to foreign jurisdiction. Ang was commenting on investigations into debt-ridden 1Malaysia Development Berhad (1MDB) which have allegedly uncovered billions of ringgit channelled to the personal accounts of the prime minister as published by the WSJ and whistle-blower site, Sarawak Report. Both quoted from documents from the 1MDB probe that is being carried out by the Malaysian government, with Sarawak Report claiming that the Attorney-General was also aware of the information. The documents show that US$700 million (RM2.67 billion) was moved among government agencies, banks and entities linked to 1MDB and finally ending up in the prime minister's personal accounts in five separate deposits, WSJ said. It said that the largest transactions were deposits of US$620 million and another one for US$61 million in March 2013, two months before the 13th general election. However, Najib has denied using public funds in a Facebook posting. Today, a Malay daily reported that he would take legal action against WSJ. Ang, however, said the media could use justification, fair reporting and qualified privilege as defences against defamation suits. He said the allegations were of great public interest case and the media could carry such news but they must act responsibly. Ang said Najib could file his action in Kuala Lumpur because his reputation was tarnished more in Malaysia than anywhere else. "Moreover, the report was published through the Internet and downloaded in Malaysia," he said, adding that a higher amount of damages could be awarded if he was successful in proving his case. Lawyer S. N. Nair said as a politician, Najib's better option was to clarify the report with WSJ. Nair said Najib could ask for a retraction of the report if it was false and demand a public apology. “But even if the publisher makes an expression of regret, nothing stops Najib from filing a suit. Only that the damages awarded will be lower because the defendant has admitted to an error without delay," he said. Lawyers for Liberty executive director Eric Paulsen, however, said it was pointless for Najib to resort to a suit because an explanation would suffice. "Najib should use all medial channels, including the WSJ to convince the public that he has nothing to hide," he said. Paulsen said politicians like US president Barack Obama and British Prime Minister David Cameron were never in the business of suing the media for publishing public interest issues. "At the end of the day, politicians live or fall based on public opinion about them. So it is better to engage the media." – July 4, 2015. If WSJs write up is totally untrue for sure go ahead and sue their pants of them . If their reports are false 100 % , thats not reporting , its more akin to slander. If Najib is 100% clean then sue every damm person involved . Do you honestly think that the WSJ is like Utusan Melayu, just publish whatever they want and worry about the consequences later on. Unlike Utusan Malayu they do not have the ruling party behind supporting them not to mention that they have a reputation to worry about and the litigation resulting from publishing the article. How often have the WSJ being sued for publishing the untruth or even the half truth. Unlike Utusan Melayu that has a record of being sued successfully numerous times since it started for publishing the untruths or the half truths. That must the reason why it is an international print media, but what else can one expect from a ruling government owned newspaper ? Just rubbish and more rubbish and more gutter rubbish. Just wait and see if this turncoat Najib will ever dare to sue them, typical of this turncoat who is ever ready to talk and talk only nothing, I reiterate, nothing will follow. A typical example of the kind of action from an Umno member ! The problem with Najib is that he never give a straight answer. " I never use public funds"..is not the same as "I never received such amount in my account". Perception plays a great deal in today's digital age..as far as rakyat is concern, Najib is guilty! Untuk pencerahan secara total, Najib perlu saman sarawak report dan awsj berhubung fitnah terhadap dirinya. bro....sudah Ku kata Najib terima jawatan PM dgn mengangkat sumpah....jgn dibuat mainan dgn sumpah tsb. sebab amat buruk padahnya....tolonglah baca sejarah pemimpin negara sendiri dan sejarah pemimpin dunia.....banyak kisah kejayaan dan kegagalan mereka. Yang aku pelik dengan sumer citer2 sensasi off late ni, takde la plak Sarawak Report, The Edge, Malaysian Insider, Malaysia Kini AWSJ etc etc etc buat pendedahan salah laku Lim Kit Siang, Tun M (lagi pulak mamak memang aku mampus tak kan percaya), Daim Zainuddin, Lim Guan Eng, Anwar Ibrahim, Ambiga dan seangkatan dengan nye since sibuk bebenor media ni dok mewar-warkan pasal ketelusan, anti-rasuah, penyalahgunaan kuasa etc. Don't tell me orang2 yang aku sebut kat atas tu baik macam malaikat, telus dan bukan perasuah tegar dan pengsonglap duit rakyat sama. Aku rase kalau kau buat survey pasal perasuah/peliwat anwar ni, budak tadika pun kata dia ni malaun tahap kronik. Kenapa Najib je yang kena ekk?? Hi Rocky.. Hold your horses guys.. Don't get too excited just yet.. We and Tun M should be more careful in addressing this WSJ issue..
Bukan maksud aku untuk jadi si "potong stim".. Hehehehe.. Tapi aku rasa macam ada yg tidak kena dgn cerita sensasi WSJ ni... Too good to be true and too easy.. I personally feel that there's something not right somewhere with these purported "revelations" by WSJ.. Najib seems not as panicky as I would expect him to be.. The state of "panic" clearly seems a "drama" type of panicking.. Somehow, i have this feeling that the so called "revelations" by WSJ is staged and orchestrated between WSJ and Najib.. Given the buddy buddy relationship between the US and Najib, is it so impossible..?? Why I say this..?? Desperate times calls for desperate measures .. Don't you think so..? 2) Najib is very quick to respond denying the report and state that he would initiate legal action against WSJ.. Suddenly Najib become so brave..??? On the contrary, The Edge had began reporting against 1mdb and Najib to reasonable depth and details quite sometime back and yet, until now not a word from Najib's mouth about initiatin legal action against The Edge.. In the aura of the above, I'm inclined to suspect that the WSJ report could very well be false and orchestrated between Najib and US administration wherein WSJ "intentionally" report outrageously false story and Najib take legal action and in the end WSJ apologises to Najib and blame Tun for such false reporting and Najib will happily accept the apology and be seen as the hero teraniaya.. Haven't you guys notice how quick, loud and confidently Najib is accusing Tun M being the person behind the WSJ report.. ??? Especially when it is an open secret that Tun M is WSJ's enemy numero uno..
3) If the above drama successfully executed, the result will be, Najib will be cleared and seen cleared from any mischief relating to 1mdb and simultaneously Tun M will be shamed beyond repair and thereafter, Najib and his team will be free to do whatever they want to this wonderful nation including but not limited to the execution of the infamous TPPA.. Wow.. Killing sooo many birds with one stone.. I may be wrong and probably am wrong and I hope I'm wrong.. But, if in the unlikely possibility that I might be right, nothing good would come out of it for this nation and its rakyat.. May God bless us all and protect us from such organised treachery.. Aminnn Ya Rabbal Alamiiinnn..
"PENGGANAS PENDATANG KAPIRDAJAL DAPBANGKAI/PKRSODOM yg. asyik jual tanah K'jaan Negeri dgn. murah termasuk pd. sy.-sy. SingaPORK, tak pula dikacau -maka PI MAMPOS 'Ngo' NWO("New World Order")-LIBERAL-EJEN-si puak PENDATANG PENGGANAS-PENGGANAS KAPIRDAJAL DAPBANGKAI/PKRSODOM-EJEN ZIONIS-PEROMPAK/PENJENAYAH- no 1 tu!!!!!!!!!!!!!!!!!!!!" Najib cleared by these simple words of wisdom. AmBank founder Hussain Ahmad Najadi, killed in 2013, same year Najib account in AmBank gets huge amount of money transferred...coincident or not. Who directed this killing? But for the sake of the country, Najib MUST sue AWSJ. I am saying that as this would be the only platform for us to hear the actual version of 1MDB issue. During the trial both Najib and AWSJ will be able to share their side of stories, not just the RM2B issue but the bigger spectrum of 1MDB. Failing to sue the blatant and mammoth allegation will only drag BN government to their knee come GE14 - there are no two ways about it. Keep giving warning won't work and definitely not enough. Since when did lawyers become great public relations consultants? I have dealt with more public relations consultants over the past 20 years and cannot recall any who have a legal background. I guess that's because the ever confrontational nature of lawyers and the ever so polite and accommodating nature of PR consultants do not go well together. The Malaysian Insider article looks like a PR exercise on its part, especially considering that it and its parent The Edge have recently been warned not to engage in false reporting by the home minister with threats that The Edge's publishing license could be revoked. Paulsen's response is the most sickening, in how he hails the WSJ as if can say no wrong, he holds up the president of the imperialist United States and prime minister of the U.S.' poodle and sidekick imperialist United Kingdom as examples for Najib to follow, then urges Najib to "engage the media" rather than attack them. I wonder what these lawyers who urge Najib not to sue the WSJ would have told the late Lee Kuan Yew who sued the Asian Wall Street Journal and the International Herald Tribune. "In 1985 Singapore sued The Asian Wall Street Journal over an editorial that criticized the government’s harassment of one of the two opposition members in the Parliament. Dow Jones later faced additional lawsuits, restrictions on circulation, and rejections of visas and work permits for its reporters. "In 1986 Singapore’s Parliament passed a law restricting the sale or distribution of any foreign publication found to be “engaging in the domestic politics” of the country, the interpretation of which was left to the Minister of Communications and Information." "The cuts were in retaliation for the Journal’s refusal to print verbatim two long letters from the Monetary Authority of Singapore." No mention of what those letters by the Monetary Authority of Singapore were about but if the Asian Wall Street Journal did not agree to publish those letters verbatim, would the Wall Street Journal give Najib fair opportunity to clear his name? Lee Kuan Yew also sued the International Herald Tribune. "The International Herald Tribune agreed on Monday to settle the last of three libel cases brought against it in Singapore courts because of two opinion articles that officials of the authoritarian Government said defamed them." Lee Kuan Yew sued and won and did not kow tow to the western media, so why can't Najib, especially since the allegation against Najib is far more damaging with accusations of criminal behaviour compared to those levelled at Lee Kuan Yew. If Najib is innocent of the wrongdoing which the WSJ report says he is involved in, then he should take legal action to clear his name and if he wins, by that he will also clear Malaysia's name and Malaysia's reputation economically as well. If he does not sue then it would give Malaysians more reason to believe the WSJ report referred to. Its either very busy or very quiet in the PM & wife household today on Sunday.... whatever that is brewing behind this close door will have a big impact for us all Malaysian in the coming days ....in Allah SWT we place our trust.